A 21-year-old officer cadet has been found dead in an apparent suicide at the Army’s officer training college. The woman’s body was believed to have been found in her room at the Sandhurst base, in Berkshire, on Wednesday. 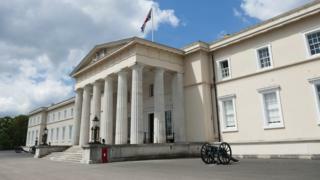 A Ministry of Defence spokesman confirmed an “incident” occurred which resulted in the “death of an officer cadet” at the Royal Military Academy. Thames Valley Police said it was treating the death as unexplained but non-suspicious. A spokesman for the force added officers were called at 15:00 GMT on Wednesday and the woman’s family had been informed. With the Trendycom GOLD features, they'll be able to access a secret console that will uncover UNLIMITED dirt cheap products from many different eCom platforms! It is believed the woman had been involved in a minor disciplinary incident, which was being investigated. The Army had also provided her with mental health support following an event earlier in her training. The cadet was in her last term at the base after joining in May. The Royal Military Academy has trained the leaders of the Army – and other countries’ armies – for 200 years. Both the Duke of Cambridge and Duke of Sussex graduated at Sandhurst, where all Army officers are trained. Training lasts for 44 weeks and the first five weeks are renowned for being one of the toughest experiences most people will ever go through. The Army website describes the college as “one of the world’s toughest and most revered military training academies” and its motto is “Serve to Lead”. A Unique chat style Email Optin conversion software proven to give highest Optin Rate in the entire industry.